Thursday night we heard a presentation on a visit of a youth group to the Heifer Project International demonstration farm in Massachusetts. The purpose of the visit was to expose the group to animal husbandry that could be useful to the development of third world nations. Heifer Project has a long history of providing breeding stock for useful for food and power for rural citizens of disadvantaged nations of the world. Part of the youth experience was to live in a demonstration village under the conditions of the indigenous peoples. They experienced for one night what it was like to have no electricity, no indoor plumbing and only the heat of a wood fired stove in a space of about 15 by 15 feet. This was an eye opening experience for all in attendance. Nancy and I had also visited this same facility several years ago and bunked in a communal tent and ate the primitive food typical of a third world nation. We of the United States are indeed privileged people. The presentation caused me to reminisce about my childhood and teen years. I grew up on a farm with rather primitive living conditions by today's standards. The farm house that I lived in did have electricity. However, we had no running water or indoor bathroom facilities. Nor did we have central heat. 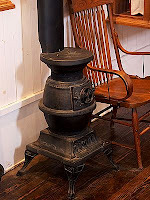 Heating was simply a wood burning kitchen stove that provided a warm spot in that area and a pot bellied coal stove in the living room for sitting room heat. Bedrooms were unheated. More than once I got up in the morning to find my shoes frozen to the floorboards. During some winter storms the wind would blow through the window at the foot of my bed and drop a sifting of snow on the covers. Thank God for a feather tick that gave one enough warmth to sleep if you did not move to let in any cold air. By the time I was fourteen we did get water piped into the house driven by an electric pump. A bathroom and central heat did not appear until I was nearly finished with college so I never did live at home with those amenities. I suppose all the above would say that I lived in hard times. Although many of my contemporaries of that era had most common amenities, many also shared the same conditions as I did. I did have the necessities of food and shelter. I would not wish the conditions of my childhood on anyone today, but as I sit in my comfortable air conditioned home, a few steps from modern bathroom facilities I am continually grateful how fortunate I am. Today it seems we take for granted all the good things we have. It seems that as a society we have moved our standard of what is necessary for a good life to almost unsustainable levels. For most of us now not just food clothing and shelter is required but we must also have multiple cars, cell phones, multiple computers, cable service, and instant connection to the world at all times. We seem to have to consume at every increasing levels to sustain our economy. Today's paper highlighted the hard times of those who are suffering long term unemployment. The author of this article suggested that in these hard times, we have become less generous to our disadvantaged fellow citizens. Perhaps we have. I do think we have an obligation as a society to provide the basics of food, clothing and shelter for the less fortunate. My hope is that both our government and our charitable organizations can at least provide the basics for life. I hope that I don't get so comfortable that I forget those who need some help.